a method in game theory to solve game positions for optimal play by backward induction from known outcomes. A sub-genre of solving certain chess problems uses retrograde analysis to determine which moves were played to reach a position, and for the proof game whether a position is legal in the sense that it could be reached by a series of legal moves from the initial position. The mathematical justification for the retrograde analysis algorithm was already implicit in the 1912 paper of Ernst Zermelo . Additional theoretical work was done by John von Neumann and Oskar Morgenstern . The contemporary dynamic programming methodology, which defines the field of retrograde endgame analysis, was discovered by Richard E. Bellman in 1965 . Bellman had considered game theory from a classical perspective as well  , but his work came to fruition in his 1965 paper, where he observed that the entire state-space could be stored and that dynamic programming techniques could then be used to compute whether either side could win any position. Bellman also sketched how a combination of forward search, dynamic programming, and heuristic evaluation could be used to solve much larger state spaces than could be tackled by either technique alone. He predicted that Checkers could be solved by his techniques, and the utility of his algorithms for solving very large state spaces has been validated by Jonathan Schaeffer et al. in the domain of Checkers , Ralph Gasser in the domain of Nine Men’s Morris , and John Romein with Henri Bal in the domain of Awari . The first retrograde analysis implementation was due to Thomas Ströhlein, whose important 1970 dissertation described the solution of several pawnless 4-piece endgames . The algorithm starts in enumerating all Black-to-move checkmate positions B0 with the material configuration under consideration, an un-move generator is used to to build predecessor or parent positions. The un-move generation is similar to move generation, with the difference that it is illegal to start in check, but legal to un-move into check, and illegal to capture, but legal to un-capture by leaving an opponent piece behind. The algorithm terminates, if no more newly predecessor positions were found, that is either Wi+1 or Bi+1 stay empty. Each one-bit in W or B correspondents to a White-to-move and won or Black-to-move and lose position. Remaining zero bits indicate either a draw, White-to-move and lose, Black-to-move and won, or illegal positions. Ernst Zermelo (1913). Über eine Anwendung der Mengenlehre auf die Theorie des Schachspiels Proc. Fifth Congress Mathematicians, (Cambridge 1912), Cambridge Univ. Press 1913, 501–504. Translation: On an Application of Set Theory to the Theory of the Game of Chess. Lewis Stiller (1988). Massively Parallel Retrograde Endgame Analysis. BUCS Tech. Report #88-014, Boston University, Computer Science Department. 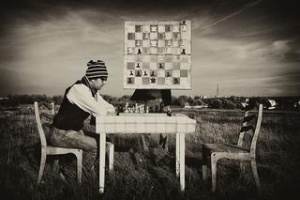 Henri Bal, Victor Allis (1995). Parallel Retrograde Analysis on a Distributed System. Supercomputing ’95, San Diego, CA. Paolo Ciancarini, Gian Piero Favini (2010). Retrograde analysis of Kriegspiel endgames. IEEE Conf. on Computational Intelligence and Games, Copenhagen. This page was last edited on 8 March 2019, at 22:10.